If you're an Ontarian by now I'm sure you've heard a fair bit about Ontario's release yesterday of the recommendations made by our Healthy Kids Panel. I'm not going to go into a point by point discussion and dissection. Overall the report's solid. It makes 23 recommendations and as I was warned in an off the record chat with one of the panel members this past weekend, they might not be my top 23 items, but as I told the panel member, that's not what matters. What matters is that they're not all fluff, and more importantly what matters is that many of them have their sights set very squarely on the environment. This is not your average Eat Less, Move More report. Instead this is a report that recognizes that the world in which we're raising our kids pushes them into the open arms of food marketers, of piles of sugar, and of boatloads of calories. Kids aren't trying to gain weight, their parents aren't encouraging them to eat poorly - that's just our new default - our new normal. While it's no doubt going to take more than 23 sandbags to build a levee, and while no doubt some of these 23 sandbags are merely beanbags, while others may have a few holes in them, what's so incredibly encouraging is that this is in fact a levee building report, and not the usual tripe about how we're going to manage a flood by teaching kids how to swim. 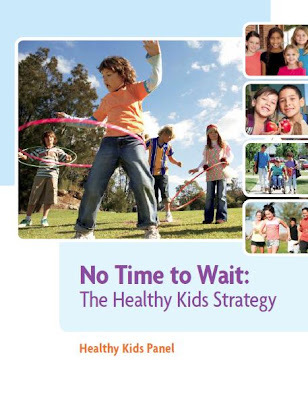 More from me on one of the 23 recommendations tomorrow and where I think it missed a crucial mark, but for today, kudos to the panel, and kudos to our Health Minister Deb Matthews for making childhood obesity prevention a priority, and with this panel's help, for rightly identifying that it's the world around our kids that's the problem, and that the kids indeed are alright. Fingers crossed too that this report, unlike many of our federally funded reports, does in fact translate into action, and isn't simply tucked into a drawer somewhere.